Mobile TV may not have made as big an impact in North America yet, but chances are it's going to be as huge as downloadable ringtones. In Canada, wireless service providers like Bell Mobility and Telus Mobility have started launching a few offerings with mobile television in mind, and there are similar solutions being offered in the United States as well. In Korea and parts of Europe, however, mobile television is in full swing -- especially Korea -- and a great way for users to catch up on news, sports, and soap opera-like dramas on the go. Streaming video was never so good, so portable. With several different standards out there, it can be a little confusing, so here is a guide to a few of the most prominent mobile TV technologies that are currently available or in the works. Satellite-based Digital Multimedia Broadcasting (S-DMB) was launched in South Korea on May 1, 2005. They are currently able to receive seven television channels, 13 radio channels, and 8 data channels. S-DMB is widely available throughout the country, but is on a paid subscription basis. By contrast, Terrestrial Digital Multimedia Broadcasting (T-DMB) was launched on December 1, 2005 and is provided free of charge. That said, it is only broadcast into limited areas, most notably around the capital city of Seoul. T-DMB is being used in Germany to broadcast the FIFA World Cup 2006, with trials and launches planned in such countries as France, Switzerland, Italy, the United Kingdom, and China. Digital Video Broadcasting for Handhelds, or DVB-H for short, was formally adopted in November 2004. Acting in direct competition to T-DMB, DVB-H is an adapted version of DVB-T (Terrestrial) for digital television on battery-powered handheld devices like cellular phones. DVB-H digital television is currently being deployed in (or planning to be deployed in) such countries as Albania, Finland, Germany, Italy, and even in the United States, the last of which being offered through Modeo. 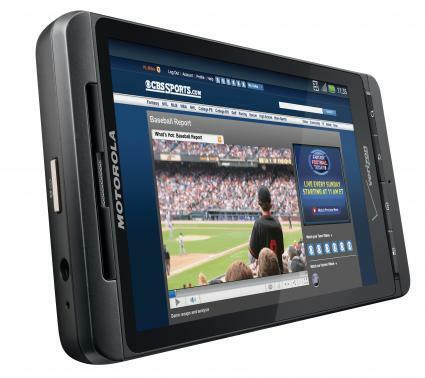 MediaFLO was developed by Qualcomm, a telecommunications company based out of San Diego, California. Like DMB and DVB, MediaFLO allows for data (most notably mobile television) to be broadcast to portable electronics like cell phones and PDAs. Other things that MediaFLO can be used for include stock market quotes, sports scores, and weather reports. Transmission is one way only (FLO stands for Forward Link Only), and in this way, the cell phone doesn't actually communicate back to the tower. MediaFLO is expected to be deployed by Verizon Wireless, a CDMA wireless service provider, some time in 2006 in half of their markets that currently run on 1xEV-DO 3G high speed technology.